Some major developments for us have included the much awaited release in the United States in 2009 of the Ross Nickerson Signature Model Series of elite 5 string banjos. There are five banjos currently in this line and they have really begun turning heads in the US on the festival circuit. Secondly, a most exciting project has been the release of the Bellbird Ulysses model electric banjo. I had the privilege of spending some time with BÃ©la Fleck when he was in Australia and apart from him playing a number of Bellbird banjos, BÃ©la also got to see and play our very first, newly completed Bellbird electric banjo. It was both a thrill and a great honor for me to hear this legend of the banjo play my instruments, but even more so when BÃ©la asked me to make him his own Ulysses model banjo. This past year I also have added another 2 models to our Bellbird range. Firstly The Cracka our African mahogany model, and secondly The Raintree our full timber all-in-one rim and tone ring. It is a magnificent model with the sweetest, most powerful tone. Please take the time to view our range of superb 5 string banjos and remember, I can also custom make a banjo to suit fully your needs as a serious player – Peter Nahuysen, Bellbird Banjos. At this year’s Redland’s Bluegrass Festival, I got to spend some time with Bellbird Banjo’s founder Peter Nahyusen. I got to hear first hand of his big news that Bela Fleck had recently purchased one of his Bellbird banjos. Not only had Bela had bought one, but that he was using it in many of his concerts. Indeed, many video clips were bobbing up on Youtube of him playing it. Ed: Firstly congratulations on the sale to Bela Fleck. You must be absolutely thrilled that one of the banjo fraternity’s greatest ambassadors has selected the Bellbird brand? Peter: Thanks, yes it was a great thrill and an incredible privilege to make Bela this banjo. Ed: What model did he get? I understand it was an electric banjo? Peter: Yes that’s right. It’s a new model called The Ulysses and it is an electric banjo. I made one for Aussie banjo player Gary Vann a couple of years ago, and set out to make an electric that was a solid body, but still had the potential to sound exactly like an acoustic banjo when plugged in, but without any of the amplification and feedback problems associated with miking up an acoustic banjo. Ed: Interesting, so how did Bela Fleck get to hear about a banjo from Australia? Peter: Around 3 years ago I emailed Bela and told him about the Bellbird Banjo Company, and we traded a few emails and discussed the thought of when he was in Australia next catching up and checking out my banjos. In mid 2007 he came out with the Flecktones and so we caught up in Sydney for a couple of hours. I had 4 or 5 banjos with me, including Gary’s electric. Ed: What was it like meeting Bela Fleck? Peter: It was incredible. I took my good friend and (Sydney-based) banjo player Bruce Fumini with me for moral support. Bela was so friendly and helpful and is a genuinely nice guy. We talked a lot about banjos and banjo set up and the sound that he was after. It was all very relaxed. Ed: Did you get to pick with him? Ed: So how did Bruce play? Peter: He did really well. You couldn’t wipe the smile of Bruce’s face for around 3 weeks. Then he asked me to play some things for him out of my Celtic banjo book that I had with me and he picked up one of my banjos and joined me on playing a bunch of tunes. 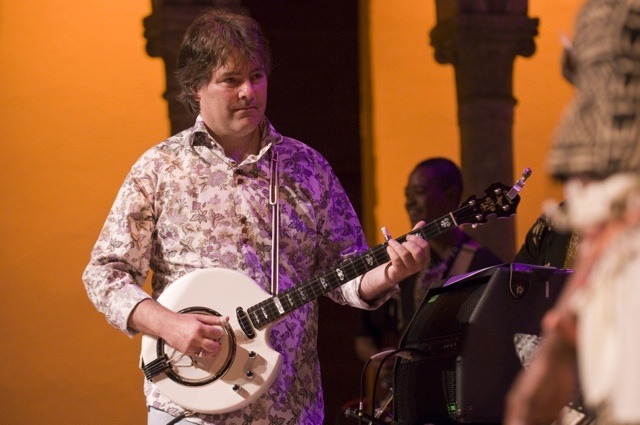 I couldn’t believe I was actually jamming with Bela Fleck. We talked about how we approached arranging Celtic songs, and it was interesting just how different we both did it. He was such a down to earth person, and very gracious and interested in what we were doing. Ed: So at some point you must have discussed buying a banjo? Peter: He liked the sound and feel of my acoustics, but he was really taken with Gary’s electric. My electric model has a little tone ring in it and it sounds very much like a banjo and it amps up really well. We didn’t have an amp there to try out, so when he went back to the USA he had me send over some sound samples of Gary’s banjo recorded. After he heard them he said he would like to buy one and placed an order. Ed: So he has got it now, what has been his feedback? Peter: Yes, he received it in early June and he toured with it for a month with African Singer Oumou Sangare and her band. I received a number of emails from him and all were extremely positive, in fact he said it was the best electric he had ever played. I am very proud of that, and very humbled as well. Bela also gave me a wonderful testimonial for my new website. Ed: You also have American player and teacher Ross Nickerson releasing his own line of Bellbird Signature Series banjos and now Bela Fleck. What does this mean for the Bellbird Banjo Company? Peter: Sales I hope. This industry is all about recognition and establishing a market presence that you can then grow. I need to get instruments out there, and be selling in the US which is the bluegrass heartland. But there are other markets too. Ross and of course Bela carry a lot of weight in the eyes of players. I have to build on that and turn my labour of love into a profitable business. That’s the plan anyway. Ed: So you have a new website about to go live, (www.bellbirdbanjos.com) and of course a successful banjo conference now in its second year. 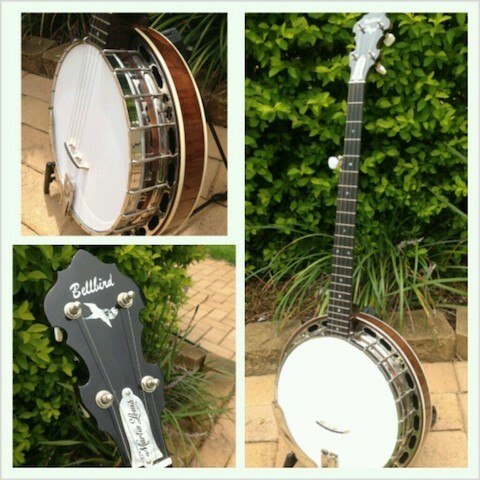 The future looks very positive for Bellbird banjos? Peter: Thanks Greg. Yes it’s been a great year, and I am enjoying every banjo pickin’ minute of it. I can’t wait for Harrietville and then the Banjo Conference in Maleny with Ross, and of course his band Hungry Hill.